It's been almost two years since we featured an E85-fueled Nissan GT-R from Switzer. Since then, the Ohio-based tuner has been steadily improving their cornfed-Godzilla conversion package to the tune of a nearly 25% power jump. 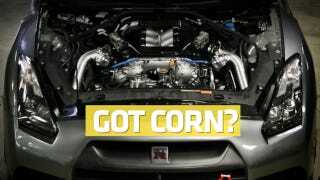 To review: The 2010-model Cornzilla netted 806 horsepower at the wheels. Tuned for drivability and a smooth power curve instead of maximum silliness, the E85-fueled GT-R that Switzer is currently updating for Colorado's Boulder Nissan has laid down a preliminary pull of 991 horsepower and 962 ft/lb of torque at the wheels. Assuming a 15% drive-line loss that's approximately a ludicrous amount of horsepower. The E1K Flex Fuel conversion involves a full engine build to Switzer's usual impeccable specs, the replacement of essentially the entire intake and fuel-metering system with components calibrated for the new fuel type, and a transmission upgrade using parts from Ohio's ShepTrans. The system automatically adjusts engine parameters to suit the alcohol content of the fuel going to the injectors. The build thread in all its invisible-flame glory is at NAGTROC. Should you be in the right part of the Lone Star state at the right time this month, the E1K GT-R will be running at TX2K12 and the Texas Mile. Also, Cornzilla is coming to eat your children.